This was a bit of a different path for Brandan. At first, when we discussed what he wanted to make, he immediately jumped on the usual track – new, never-been-tried-before seafood of some variety. After all, we’ve made sea cucumber, swordfish, and a seafood gumbo featuring squid. So when he first mentioned shark, I followed him in stride, working to create ideas for shark steaks and side dishes. We nailed down our plan. 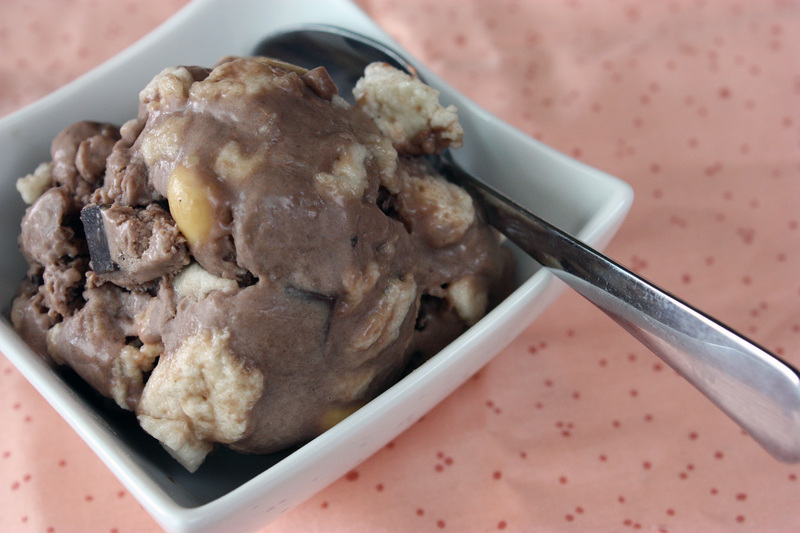 The next day, in a random discussion, the topic of rocky road ice cream came up. I admitted that I loved rocky road ice cream to him, and he agreed that it was a pretty great flavor. That’s when he surprised me – he wanted to make rocky road ice cream instead of shark steak! My boy, who is into all things challenging, strange, and heavy on the protein, wanted to make a rather “normal” dessert. Of course, I was happy to oblige, and changed our plans accordingly. After making several dairy-free ice creams in my recent past, I hardly follow a recipe anymore. They’re so quick and easy, especially if I’ve pre-chilled the coconut milk and the ice cream maker bowl (which lives in our chest freezer). Ice cream is basically a dump-and-stir process, and then with a quick churn in the ice cream maker, it’s ready to go in the freezer. Easy peasy. I did make this recipe a bit more difficult, however. I did not want to use store-bought marshmallows. I have trouble digesting corn, and every marshmallow I’ve found in the stores uses corn syrup. So I opted to make my own. I tried two different recipes – one sugar-free, and one not. The sugar-free one I tried was from Z’s Cup of Tea. That recipe used honey. Unfortunately, I forgot to add the vanilla extract, and they tasted too much of honey. However, I really want to try them with agave nectar instead, because the marshmallows were lovely and springy. (Also, if you check out her blog, you’ll find that she whips her marshmallows by hand! That impressed me immensely.) I decided on my second try to make marshmallows with sugar, just so I could understand what they were supposed to be like. I followed Deb’s instructions at Smitten Kitchen, only I substituted agave nectar for the corn syrup. They turned out beautifully. (So much so, that I could hardly stop eating them) Next time, I’ll know just what to expect when I tackle those agave-only marshmallows, and there won’t be a mountain of sugar used in the process. Those marshmallows were ready to go when Brandan and I set out to make our ice cream. I cut them extra small so there wouldn’t be huge bites of marshmallow, but they were still somewhat larger than commercially made. No matter – we like marshmallows at our house! The verdict? This ice cream definitely had more flavor, and in spite of the full-sugar marshmallows, was a tad less sweet than commercial ice creams. I think we declared it a winner. Brandan did for sure – he took the rest of the ice cream and remaining marshmallows home to his Mom’s house at the end of the weekend (much to my relief – I find that I can easily become addicted to sugar!). Will this mean that in the future, Brandan won’t cook challenging foods? I hardly think that’s the case. His sense of adventure is still strong. I anticipate having to hunt down a bizarre food soon. In a blender, add the coconut milk, almond milk, xanthan gum, cocoa powder, and salt. Blend until there are no longer lumps of cocoa powder. Add the agave nectar and the extracts and blend. Pour mixture into ice cream maker and process according to manufacturer’s instructions. Pour into a freezable container and stir in marshmallows, nuts, and chocolate chips. Freeze 4 hours or until firm. Makes over a quart. If your ice cream maker can’t handle this volume, consider cutting the recipe in half or processing in batches. For the next few weeks, Kids in the Kitchen is changing just a bit. Rather than discussing with the kids what they want to make days beforehand, we are instead visiting the farmers market on Saturday mornings for inspiration. This is all part of my hope that they’ll choose something fresh, healthy, and delicious to incorporate in their meal. We’re entering peak growing season, and they have so much to choose from that we figured it would be great fun! Brittany and I walked the farmers market this morning, and once she laid eyes on some Texas-grown strawberries, it was love. We discussed what we could make with the strawberries, and I threw out some suggestions. Ice cream was the decision, and so we bought two baskets (about a pound and a half) and went home. Since I am now following a dairy-free diet, (something that is new to the kids) Brittany thought it was a good idea to make a bit of “special” ice cream dairy-free, so I could have a bit. (What a sweetheart!) So we made two batches – one full batch of strawberry gelato (I opted not to fuss with eggs and the making of a custard), and one half batch of vegan, gluten-free, dairy-free strawberry gelato. They were extremely simple to make, and emerged from the freezer creamy, pink, and full of sweet strawberry refreshment. It was a perfect compliment to the near-100 degree day. Place all of the ingredients in a blender and process until no large strawberry chunks remain. Pour into the bowl of an ice cream maker and process according to the directions on the ice cream maker. Freeze for 3-4 hours or until firm. Apparently, all of the kids wanted a chance to make dessert. Matt chose chocolate ice cream as his dessert of choice. While we’ve made homemade ice cream in the past (this past summer, each of the kids made a different flavor), we haven’t done so specifically as part of the “Kids in the Kitchen” series. So – chocolate ice cream it was. I don’t know why it took me years to get an ice cream maker. I suppose I just never saw the need for one – it was another appliance to take up space. But when I purchased my KitchenAid mixer last year, I received a rebate for a free ice cream maker. Of course, I took advantage – and I’ve loved it ever since! 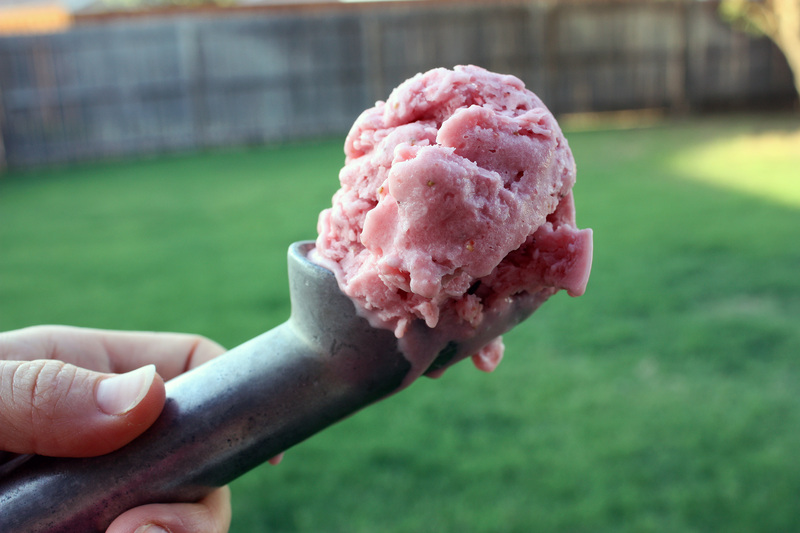 The ice cream maker attachment is simply a bowl that can be stored in your freezer, and a special paddle attachment. 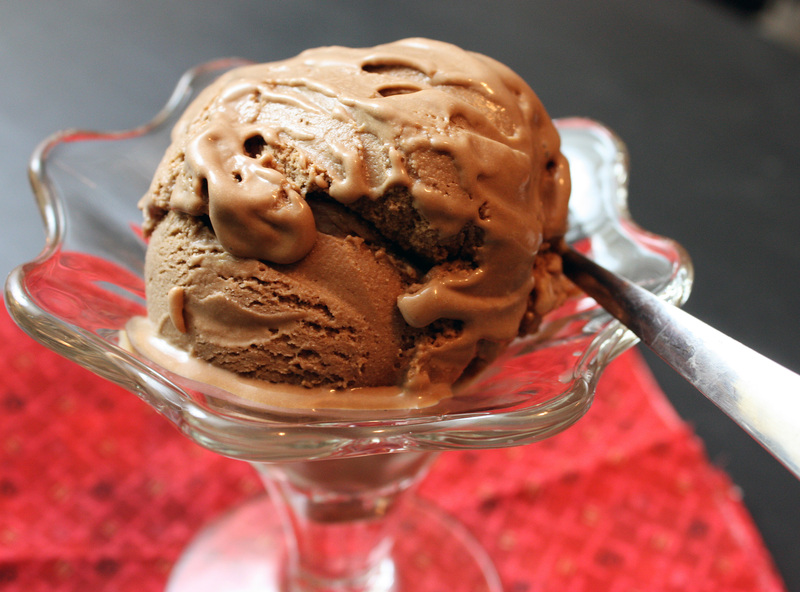 It mixes ice cream like a true champ – and with this recipe, you can have extremely creamy, chocolate-y ice cream that rivals the best store-bought brands. And it’s gluten-free (unlike my favorite Blue Bell Dutch Chocolate – why, oh why must wheat be in the strangest things?) What’s not to love? Of course, Matt had to taste test every step of the way. Not that I blame him. With a bunch of creamy chocolate, who can resist? Our family devoured most of this ice cream last night, but I’m strongly considering sneaking into the freezer for a few more indulgent bites. Place the cocoa powder and the cream into a medium saucepan and whisk. Add the the milk and the coconut milk and whisk in. Bring to a simmer over medium heat, whisking occasionally, and remove from heat. In a medium bowl whisk the egg yolks with the sugar. Temper the egg yolk mixture by adding a few ladles of the milk mixture in and whisking with each addition. Pour the tempered egg yolk mixture into the remaining milk mixture and whisk until combined. Place back over medium-low heat and whisk until the mixture thickens slightly and coats the back of a spoon (about 175 degrees F). Pour the mixture into a freezable container and allow to sit at room temperature for 30 minutes. Stir in vanilla extract, cover, and place in refrigerator for 4-8 hours. Pour mixture into an ice cream maker and process according to manufacturer’s directions. Place in freezer for a few hours to allow the ice cream to firm up. A few weeks ago, the much-anticipated ice cream maker attachment for my Kitchenaid mixer arrived! You see, I have never made ice cream prior to its arrival, so I’ve been dreaming up amazing flavors, researching, and dreaming of my first batches of ice cream, mouth watering all the while. But when it actually arrived, I couldn’t decide which flavor to make first. To be 100% honest with you, however, this butterscotch is the second batch of ice cream made in our home. The first? A not-so-remarkable mint chocolate chip. (I forgot to buy whole milk, so along with the cream, I used 2%, which made it sort of icy. Also, I used fresh mint leaves, rather than extract, which was a subject of much debate between my husband and I. His opinion? Too earthy tasting, and too strong. Mine? I wanted to make something with natural flavors, and I kind of liked it. It was pretty strong, though.) Regardless, it wasn’t the “amazing” ice cream recipe I wanted to share with you. So, ice cream attempt #2. Butterscotch ice cream. See, I love anything butterscotch. 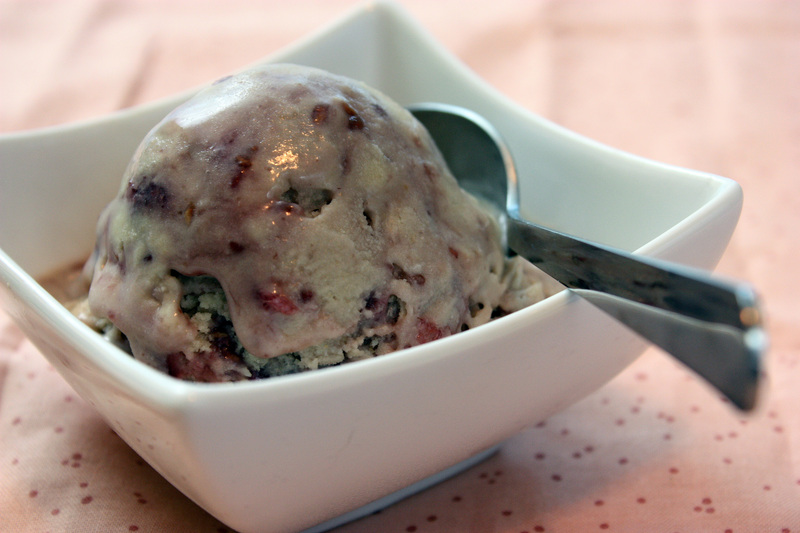 During my ice cream research, I came across Deb’s recipe at Smitten Kitchen, and well, I was smitten! I even went out to purchase a little bottle of scotch, (If you live in Texas, then you know that this isn’t always an easy feat – purchasing liquor. It’s not just in every store. Many areas are dry, or only sell wine and beer. This means that liquor purchases require planning and special trips.) just so I could make my ice cream be the best it could be. An added bonus? The liquor in this ice cream (and maybe the butter too, I’m not sure) allows it to remain creamy and soft enough for scooping, even after days in the freezer. If it lasts that long in your house, that is. In a 1- to 2-quart saucepan over medium heat, stir brown sugar and butter until butter is melted, sugar is dissolved, and mixture is bubbly, 3 to 4 minutes. Whisk in 1/2 cup whipping cream until smooth. Remove butterscotch mixture from heat. Add vanilla and scotch. In another 3- to 4-quart saucepan over medium-high heat, combine remaining 1 cup whipping cream and the half-and-half; bring to a simmer. Meanwhile, in a bowl, beat egg yolks to blend. Whisk 1/2 cup of the warm cream mixture into egg yolks, then pour egg yolk mixture into pan with cream. Stir constantly over low heat just until mixture is slightly thickened, (it should coat the back of a spoon) 2 to 4 minutes. Immediately remove from heat. Pour through a fine strainer into a clean bowl and whisk in butterscotch mixture. Chill until cold, stirring occasionally, about 2 hours; or cover and chill up to 1 day. Freeze mixture in an ice cream maker according to manufacturer’s instructions. Transfer ice cream to an airtight container and freeze until firm, at least 6 hours.